Admittedly I don’t plan on tweaking as much as planned at this moment – I will definitively be running 50-1296 mhz at the moment. Definitely going to keep eyes open for transverters, and amplifiers in Dayton, no matter what I think at this moment it’s safe to say that it’s going to at least be that that spread at the moment. 6m will finally have a reliable antenna – I have one on order from a recently dissolved contest station that is a 3 element beam with collapsing elements… this was actually something I was planning on building during the upcoming months, however someone offered one up, and the price was right, so how could I not turn it down? This is a huge time saver for someone who’s free time is few and far between during most of the year, and hopefully alone should pick up the slack that I had in the last half dozen contests – a solid 6m opening puts crazy amounts of mults out there that just cannot be missed. The other issue I’m attempting to address is logging – I’m thoroughly concerned that due to time issues I was having within RoverLog, this will lead to some points lost in the January contest. I’m hoping to transition it over to N1MM or N3FJP run via Windows Emulator on my MacBook. Being an Apple user when it comes to radio software is a little tricky – there are applications out there for logging, some really good ones too, but they just aren’t designed for contesting, and the ones that are aren’t setup for VHF/UHF Contests. I’d really like to get my hands dirty on this front and begin to develop something for iOS/Android over the next year or so, but given that I have very VERY little programming experience (as in I gave up at “Hello World” with Java, and have made a Random Number Generator with Python), this is going to be an endeavor. The platforms are ripe for picking in this front, but that’s down the road for sure. All in all though, I think due to the assist I was given by other local hams in getting something good to go, January (despite the weather) went as well as it could – and June will be the best contest yet, I can feel it now. Even if I don’t add any more bands, I’ll be on location, and on the air on time, the question is what grids and what locations are going to be the plan to hit? This is the million dollar question. “Well what charger do you need! ?”: Standards at an Awkward Time, and How much longer does Android have? I was in the middle of something and couldn’t immediately break away, so I proceeded to ask, and we went back and forth for a few mins, other chimed in, but this led me to a realization of how many various consumer devices are using different connectors at the moment. And on top of that, how little people know about their devices in some cases. I understand that people just want a device that works, but shouldn’t people have a better understanding of just how it works? In school we all get the basic science of computers explained to us Hard Disk space, versus RAM, etc., but as time goes on things change, and we have to educate ourselves on those changes. It can be difficult to keep up sometimes, but if you want to use these devices, you should be able to sound some semblance of educated, or at least have a basic understanding of the question. Knowing what type of port your phone is should be a minimum, as when you go shopping for a new cable as we all have to do, you should know that you need a lightning connector, or a micro-USB. While we’re moving towards the standardization of the USB-C port (keeping in mind different protocols from USB 3.1.2.3 or whatever it is, versus Thunderbolt 3 all working off that connector), with even Apple adding it to the latest generation of iPad Pro, and the MacBook having it for over a year now, this comes at kind of an awkward time in technology. The average life span of mobile devices, as apple pointed out in it’s last report, is longer than ever – therefore the transition over to a more standard connector on new devices is going to take a little more time than it would have in the past to actually get rolled out. For the time being, the most that anybody can do is just keep an eye on what’s going on with this, and as things move over, try to stay on top of it. Standards only become standards because people want them. Sure, this whole exchange above led to an Android versus iOS debate as it always does, and as someone that has used both I have settled on iOS as my preferred mobile operating system – admittedly due to being committed to iTunes with purchases, and much preferring iMessage over any other messaging service. There are various applications where I can see Android being a much better alternative, but for me that’s not the case. This brings up a question based on Google’s history – How much longer do we really think Android will be around? This month Google is killing a bunch of applications, and launching a gaming service with ChromeOS in mind. All of its new hardware (short of the Pixel phones) are running versions of Chrome – could Android be among the services that Google is considering ending? The Chromecast is right up there with the Fire Stick, and Roku as far as affordable streaming devices, and has support for iOS as well. Its new Stadia service will be usable on a Chromecast Ultra. What’s your opinion? Is Android on its way out now that they’ve gotten it to a refined point? Is Android what it once was, the space where the geeks could do what they please with the OS, or is it becoming as locked down as iOS with a different shell? About two weeks ago I posted about a Chinese Wearable, I’m thoroughly anti buying products that are not directly sold through US retailers, however I figured for the price, and the overall high customer satisfaction score that it had off of Amazon (which I guess technically classifies as a US retailer), I’d give it a shot. This is the second time I’ve done this with products there over the last year or so – the first being a pair of Bluetooth Headphones branded “Popchose,” I’d never heard of them, and honestly still have no clue who they are, however they are to date the best Bluetooth Headphones that I’ve owned to date, miles ahead of the LG Tone set, and about on par to the Plantronics, however the battery is much better… but I digress. This was the catalyst for me deciding that maybe these were okay, and that I should give them a shot. Besides, it has a decent return/exchange policy, and again, the reviews for both customer service and the product itself were very positive, so why not? I was in the market for a new smartwatch, my previous “Pebble” smartwatch (RIP Pebble) was some odd company I had never heard of, and they blew up, so I wound up ordering it. This product arrived on a Tuesday, and it was Saturday morning before I ever put it on the charger because I wanted to test the battery life a little bit. It was at 81% when I removed it from the box, and after it performed all of the “day one” updates. I installed a custom watch face that has seconds ticking, so that tends to drain the always on display a bit more than the traditional minutes only display. In addition, it continually updates my steps/calories burned every minute, and measures my heart rate every 10 minutes, and I also configured it to maintain a GPS connection as well. Basically, I wanted to set this up to have as much wear and tear on the battery as possible to deem exactly how long I could get it to last without a charge. I took it off when I went to bed that night, leaving it off of the charger, and it remained at 81% when I checked the next morning. I work in an environment where I am constantly moving, and always on my feet (sure, there are some exceptions to this, but for the most part I’m always moving), which means that it will constantly be documenting my motion, and steps. For the first day, it was a really busy day, therefore I was moving an above average amount, it kept right up – to kind of calibrate for my own piece of mind, and understanding before I left for the day – I picked a fixed point, and walked to that place. It was 96 steps by my count, I started at the top of a minute, it took me under a minute to get to my stopping point, so when I stopped, I lifted up the watch, waited for the minute to be up and for it to update my steps, and when it did, there were 96 steps added to my count for the day. I was impressed, I mean I shouldn’t have been, it’s just the device doing it’s job, but the odd company I had never heard of was more accurately counting my movement than my Samsung Gear Fit, or Apple Watch Series 1 ever did. There are quite a few basic functions built into it as well such as workout tracking, which I found to be simply okay. If you’re running on a treadmill, it does a pretty good job at tracking your heart rate, and calories burned, however you have to use it for a little bit for it to calibrate to you. There is a bit of learning required by the device. For example, when you finish your workout recording, say you’re getting off the treadmill and hitting end, it will give you a summary of what it’s recorded. When you hit next, it will allow you to calibrate the distance ran. My workout only recorded .85 miles on the treadmill, when in fact I went 1.01 miles. It was more accurate the second time that I used it, but still not quite synced with the treadmill from that perspective. Moving on to weight equipment, usually on other devices I can simply select an “other workout” option, where it’ll time me, record heart rate, gauge physical stress from that, and really I use it more just to track time doing specific workouts – this however does not have that option, which I see as a missed opportunity for more people in the fitness community. With that being said, I primarily will run, and bike, and this device has both of those in there, so I’m pretty well set for that. The sleep tracking is an interesting feature, both my prior Apple Watch, and Samsung Gear Fit had these features, however the battery life was not nearly long enough to actually use there, and this is something that this does a great job at tracking. I’m thoroughly impressed at its ability to pinpoint exactly when I fall asleep, and when I get up, for the latter end it’s usually within about 3-5 minutes of when I actually get up, and as far as I can guess it’s quite accurate as to the time I fall asleep to, I’m not staring at a clock when I’m crashing at night. It shows you how you compare to other users, as it anonymizes your data, and compares to other users. According to the app, I usually go to sleep about 2 hours earlier than the average user, however I’m up earlier than most… and I also sleep better than more than 75% of users! There is something mildly creepy about sharing all of this data, but at the same time, it is nice to be able to see these metrics on my own screens, to change my habits if I’m not sleeping well, and see some data driven results as to how my changes are actually effecting my sleep from a more clinical perspective, and less of a “sure, that helped a little” perspective. All in all, I think that this device is great for someone that wants a basic activity tracker with a few more advanced features, and does not want to pay an arm and a leg for one of the more main stream devices – Xiaomi is a large company overseas, and this is not meant to detract from that, however in the US they’re a no name, and I likely wouldn’t be prone to buying one of their devices normally… besides, we know about all of the conspiracy theories with Huawei and data collection, is Xiaomi another one that may be collecting data too, and we just don’t know it yet? Probably not, but a lot of people will err on the side of caution. With all of that being said, I do recommend this for someone as their first smartwatch, if you’re not sure you’re going to use the features, or remember to charge it, or what have you. If you have one presently, and are looking for an upgrade, I would say that depends on what you have now, and what you’re looking for. There is an actual watch UI, which is more than the Fitbit Charge or Alta has, but the workout tracking features just aren’t as advanced, so if you want more of a watch, and less of a tracker, this is for you. I would say that this is just a stepping stone to something like a Samsung Gear or Apple Watch if you’re looking for a device that does more, and that if you’re looking to really step into the world of wearables, look into those before you look too much further into these, because you’re going to be disappointed if you think you’re getting something like those, and get one of these. 2019 has already turned out to be an interesting year in the tech world, and it’s only February. Samsung, Huawei, HTC, and Xiaomi have all announced folding phones that are all priced in the $2000-3000 range, which puts them more in the luxury device category… 3/4 of these are Chinese companies, and items that are “Made in China,” from what we in the US refer to as off brand companies are not items that we would traditionally call luxury products, what does this say about the changing landscape that it the global economy? Is this something that we can look more towards in the future? Being curious about this, I was doing a little research as to what some of these Chinese brands have to offer, and other than scandals involving executives from Huawei, data leaking, etc., there isn’t much that’s sold in the US. For a brief time their Honor line of Smartphones were sold in Best Buy, but due to the current Trade War and Tariffs being imposed on products made overseas, there virtually not sold by US retailers anymore. However, of course you can buy anything you’d like online! Through looking at these other products, I came across Xiaomi, and a subsidiary company Huami, which has become one of the leading companies globally when it comes to the wearables market. I’m usually of the mindset of buy from a company that I know, and I have no clue who these guys are, but their device the “Amazfit Bip” Smartwatch was an Amazon Choice device, under $100, ($75.99 to be exact), and had an average 4-star customer review, the majority of which were between four and five stars, with almost 2000 reviews written. After combing through some of the positive and negatives, I figured, hey, why not? I’ve been wearing the watch now for a little over a day, and I can say at this point, I’m thoroughly impressed. We’ll see what a week of usage comes back with, however it’s as accurate as the Samsung Galaxy Gear Fit I had previously, which was slightly more accurate than my Apple Watch Series 1 before that when it comes to activity tracking. The touch sensitivity is right there with all of the other devices, I know the cheaper devices can sometimes have a slow response time due to less processing power on average, but that is not the case here – likely due to the fact that it really cannot be bogged down, it has its main features it’s designed to do, and won’t do much more. The customization aspect is severely lacking, but I knew what I was getting when I picked it up – a cheap, well liked Fitness tracker. My guess is that in the next 3-5 years, we’re going to see an entirely new wearables marketplace and landscape. It’s ugly, but I think that Nubia is truly into something with it’s “Alpha” platform, a fully functioning smartphone on your wrist. While this is kind of playing into the foldable phones marketplace, it’s more than just a phone, it’s a smart watch as well. While this is contrary to my “multiple devices doing things perfectly” theory that I hold to, I believe that if we truly want to only have one thing that we’re carrying around, this is the way that the landscape will shift. While it’s bulky, kind of ugly, and running a custom version on Android (don’t get me wrong, Android is great, and a perfectly capable OS, but custom shells tend to create problems) I think that this is the way we can see more things shift, if there’s just a solid design behind it. What does this all mean though? It means that there are new companies looking to really get their foot in the North American markets by releasing their cool, new more neat looking gadgets in a public forum, they’re now in the consumers minds. Looking at the landscape that’s in front of us now, we’re seeing a little bit of innovation in the Smartphone marketplace for the first time in a while – everything that’s out now looks quite alike, sure some have different notches, and some have glass or ceramic options, but they all look like a thin block of carved glass. The last true innovation in this area was wireless charging capabilities – we’re going to see a huge jump to things that can bend, fold, and mutilate to any position that we’d like, and processing power that rivals a lot of modern laptops (see Samsung’s 16gb RAM model of the s10!). It’s going to be an interesting couple of years for sure… being the Apple-o-haulic I am, it’s going to be interesting to see what their response to this is. The Condensation of Devices: Multiple devices doing each task perfectly, or a single device that does an okay job of multiple things? Over the last, oh, I’d say 10 years or so, we’ve gotten to a point where we condense everything down to a single device if we can. Our cell phones are our music players, our readers, our camera, and our way of interacting with everyone and sharing these photos (which makes sense given that they’re a phone – but I’m talking about social media here). But is this the best option? Up until last year I still used an iPod Classic for the majority of my music, and that’s because that was a dedicated device built specifically for music, it stored a ton, and worked perfectly. There was never any question whether it was going to play or not, if I didn’t have cell service I still had access to my entire music library without worry on a road trip. Now, while phone storage is becoming increasingly larger, storing music locally is becoming a thing of the past thanks to services like Spotify, and Apple Music (full disclosure I am also an Apple Music subscriber, though I prefer having everything stored locally). This begs the question though, our phones aren’t the best method of playing music – storage is limited, Apple for example is making it increasingly more difficult to sync music to your phone via USB, wouldn’t you rather have a dedicated device meant solely for playing your music library? It performed that one task very well, and that was all it did? I know I can’t be alone in that mindset as Sony still makes the dedicated music player, with a throwback name, the Walkman. It does a single task – plays music. And it does a fantastic job with it. I’ve had this for a little over a year and absolutely love it as an iPod replacement. Sure – the ereader is still around, there’s still a version of the Barnes and Noble Nook that’s an epaper display and not a Samsung Tablet running Nook OS. Amazon still makes the Kindle Paperwhite, and Kobo is still booming overseas – in fact they took on support for the Sony Readers when Sony discontinued support for the product in late 2014. When I got this reader in 2007, I used it for virtually everything through school – I’d scan my notes to PDF, and upload them to this so I could carry all the previous days notes without the worry of crumpling and shredding the papers, or losing them, knowing how disorganized I used to be… okay… kind of still am, but am a lot better than I used to be. As time went on though, while they’re still big in some markets, we moved to other devices, Apple launched the iPad at a price that the average consumer could afford, and suddenly the tablet market had taken off, leaving eReaders (as a standalone device at least) seemingly into the dust. I could get into GPS devices as well, however those are still alive in kicking for people that tend to trek to places where there just isn’t cell reception – I love a trip to the mountains to go hiking, and fishing, so that’s when I have the offline maps ready! Now, I’m not suggesting anyone dust off the old Palm Pilot for an address book and something to quickly jot down notes, to break out their pagers for a text, and bring around the “Zoolander” phone to make a call, these are some areas that the average Smartphone OS has definitely improved, but when you’re using your sole Android or iOS device, you have to feel like there are features missing from the music player, or eReader? Sure, the GPS with Google Maps has gotten significantly better when it comes to offline maps, but it still doesn’t compare to having one dedicated GPS device. When you’re traveling, or listen to a lot of music, the storage for tunes is drastically missing in the modern cell phone – I have over 100gb of music on my computer, how in the world am I going to put that on my phone with the sheer volume of photos I take? When you’re in a professional setting, what do you use to take notes during a meeting? Paper and Pen, Tablet (either with or without some type of peripheral input), or a Laptop? I have been in the tablet mindset since I purchased my first device in 2010 – the WebOS HP Touchpad. While I eventually hacked it and put Android on it, that was merely for ease of application updating, as well as to give myself a much larger app database to work with, as HP eventually gave up on the Palm product, and left a few years before they eventually made the source code open. In my mind, the tablet is the perfect device for any setting – they’re relatively light, in fact my iPad 3rd Generation, and iPad Pro are 1/2 the weight of what the Touchpad was, and they all can do a lot in such a small package. When I graduated High School in 2012, I was really trying to figure out what to do financially about college textbooks – I was already taking out a massive amount of debt just to attend, did I really want to dole out a few thousand more a year just for books? I then looked into Apple’s Education platform that they were launching at the time – interactive textbooks? Active hyperlinks to videos from the publisher? In book clips, or pronunciations for foreign languages? Sold. Not just that, but a book that could potentially cost $300 for the print version and a CD to try and load on my lagging Windows computer, when I could have an interactive version literally at my fingertips for $170? That led me to sit down and do the math – If I’m saving $130 here, $50 there, $200 on that – I’m up to $380 in savings in my first semester by buying them digitally and getting a cleaner version that has updates as they’re published. It would be stupid not to do this. Of course, being the Apple-holic I am, and after some research that is, I went with the top of the line at the time iPad – this was the 3rd Generation iPad, 64gb Storage, Retina Display…..but Just missed the boat on the lightning connector. Sure, I did research some other tablets, and was sold on the HP Touchpad as mentioned before but the reason I got one in the first place is that I was able to get one was that I purchased it for $50 as HP had decided to discontinue the device, and blow them out of every store. The other device I was seriously considering was the Toshiba Thrive tablet – 32gb of internal storage, however it has a memory card slot, full USB ports, Full HDMI, and was spec-ed pretty similarly to the iPad, however it was running Android. As someone who has been an (almost) consistent user of Apple Phones for the better part of the last 10 years (with a year and a half off in there to try out the Motorola Modular Platform), not to mention having used iTunes for all of my music since 2004, an iPad made the most sense for multiple reasons. Less than a month after I bought my device, Apple released a very similarly spec-ed iPad, barely anything worth noting, but it had their shiny new connector – which funnily enough would become the new standard I would need to use between devices…. and had to keep a stash of 30-pin connectors for the older iPad. That original iPad purchase was in August of 2012 – it’s now February of 2019, and I still have that iPad, and it’s still functioning… for the most part. The OS is well out of date for sure as the hardware will no longer support the software, meaning that a lot of Apps will no longer update, and that a lot of things that I would previously do from it I no longer can. It still is a great tablet that I magnetically mount in the kitchen to display recipes, or watch a streaming service while cooking, but 7 years and out of date software/hardware, that’s about it’s usefulness anymore. And that alone is longer than the life of any Windows computer I have ever owned to date – therefore I’m okay with that. And it’s also why I purchased a new iPad when I was looking for a new tablet to power use, I was looking for something to run Google Analytics, do basic Excel functions, as well as potentially do some basic graphic design (which if you have any suggestions on programs, I’m all ears! ), and the iPad offered all of those features and more. If I can get the sam lifespan out of this device, and Apple can consistently provide on this, they’ll have at least one customer until they discontinue making the product for sure. 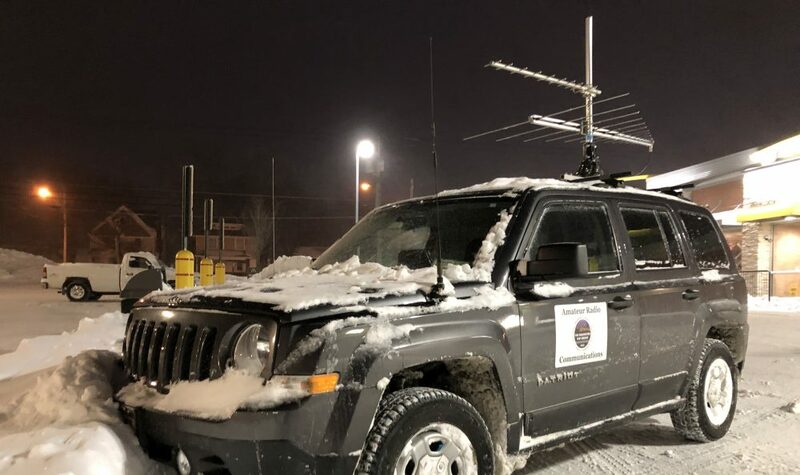 Being about three months away from Dayton, and four months out until the next contest, with June VHF and Field Day within a couple weeks of each other, I think it may be time to put the radio talk on hold for a little bit – there’s a lot of other stuff going on! What’s on the agenda? Well – this blog is going to go back to more than just radio – with moving into a new house, sure there’s going to be some radio talk, in fact I’ve started to setup a nice shack area (see below), but we’re also (kind of) converting it to a smart home. We talked about it before we moved in, and had decided not to do the whole smart home concept, but as we’re going along and replacing odds and ends like light bulbs and the thermostat, I’m noticing some of these items have nice energy monitoring features that I really like, so I’ve said screw it, and we’re slowly transitioning over to a semi-smart home. The first question to ask was what ecosystem of smart products do we want to go with? What do we use for our control, and hub? Well, a few months ago I had a coupon for Best Buy, and they had just started running all of the specials on the Eco Dot’s, with the 3rd Generation being $24.99 – that plus $10 off? Sure, let’s get an Echo to play with. A few weeks later Christmas shopping, I bought something that allowed me to purchase an Amazon Smart Plug for $5 – well… sure, I’ll try it. Let’s see how useful it is! I had the Christmas lights plugged into it all month, and it was really nice to be able to go, “whoops, I left them on!” and go to the app and turn them off. In the real transition to the smart home setup though, we’ve begun changing out all of the old incandescent light bulbs, and installing Phillips Hue lights, using an Echo Plus as a Hub. The Echo Plus came with a Hue bulb as well – and I had a 30% off coupon for that device as well. So far so good, and we’re up to 8 lights – 7 of which are Alexa controlled, and one using a Hue Dimmer Switch. One thing that I’ve read is that when you’re getting closer to 20 or so bulbs, the hub in the Echo starts to get a little laggy, so moving over to a Hue hub is the way to go then – with that said, I don’t think that we have that many light sockets in the house where that’ll ever be a worry. There are a bunch of the smart thermostats on the market, but after a lot of research, finding a sale, and holding a store to their Price Match guarantee, I was sold on the Ecobee 3 lite. The beauty of the Ecobee is the lack of having to mess around when you have an older system. The furnace is about 15 years old, which isn’t all that old, but it’s just old enough where it’s lacking some of the extra wires needed for items like the Nest, or Emerson. The Ecobee provides an adapter kit, so thermostats with four wire connections can be adapted to send power from the furnace to the thermostat that would normally be sent via a fifth wire. This thermostat offers all of the same capabilities of the others, such as vacation programming, scheduling, daily settings, etc.., integration with just about any assistant that you would want to use (Don’t think it’s compatible with Cortana, so sorry to the three people that use that), requires no Hub to function, and is about half of the price of others on the market. How can you go wrong? I think that this is where we’re going to keep it for now, I’m looking into the Wyze Camera’s, they’re one of the highest rated out there right now, an American company, and their products are only $20, and $30 respectively. For that price, it’s worth trying, but for now, I think we’ll hold back at the pseudo smart home status, and finish getting settled for the time being..
Hi Everyone! So my grand plan of writing frequently hasn’t quite panned out as I had posted about – I still have a quite a few posts canned for publishing, I just need to read them over so I don’t sound like a complete dimwit… with that being said, it’s not really in the cards to get to those at the moment, but I thought I would make a quick post about how contest prep has been going! I’ve been fortunate enough to have a fellow club member assist me with the construction of a luggage rack mount for antennas, in addition I’ll be borrowing a couple antennas, and utilizing a few home built ones as well.. The goal of this? To cut setup time to virtually nothing but getting out of the car to add a few feet to the masts to give more height. This will definitely aid in the addition of more grids this year. In the past two years that I have really gotten into the rover form of contesting, or just contesting in general, I’ve done a few modifications here and there to make operating easier, but overall, I haven’t contributed much to aid my setup times, which would seriously help with the ability to add some more grids. I always go out with the plan of operating from four grids, but usually something happens, and I’m stuck operating only two or three if I’m lucky. This year, I’ll be shooting for five to six, but I’ll be happy if I can at least circle my four. The plan will be to operate three or so hours in a grid, and move on. In addition, instead of hoping I’m typing the correct call in the dark, I’ve been able to get Roverlog, the software that I have been using on my tiny ASUS Transformer for the last four contests, running within my MacBook!! Meaning that nice illuminated keyboard will be at my disposal finally! In addition to that, I will be running WSJT-X for digital mode operation from the rover… assuming that the rig interface is still functioning well. That is something that I have been unable to test yet, as we’re in the middle of a move, and all the radios just were packed up as I got everything working well. With any hope, so long as all is functioning properly, and I’m on the air on schedule, I think that this is on pace to be the best score yet in a contest for me, and if not, we’ll see what can be learned from this moving into June. Usually I’m scrambling the day before, but I think at this point I can officially say that even with this being near the bottom of the totem pole as far as current priorities, I’ve put more planning into this than previous years, and I’m incredibly grateful for the big save I’m receiving for getting antennas properly mounted for roving this year. As long as the remainder of this move goes according to plan, we’ll be right on track for the remainder of the contest planning, and ready when it’s go time! When it comes to wearables, everyone seems to have their own flavor of the day. It seems like every major phone manufacturer has at least dipped their toes in the wearable market based on the saturation of them out there. Sure, Apple Watch, Samsung Gear, Fit Bit (insert model), and Garmin Vivofit are the most popular brands, but they’re not the only ones. There are tons of knockoff, cheaply made, somewhat effective wearables out there, and sure, if you just want to see if you’d even wear it, get one of those $15 ones at Dollar General and give it a run! Or pick yourself up the $60 Fit Bit if all you want is the activity tracker. They all have their purpose, and each watch has their own niche. These are the three that I have used, and the verdict that I draw from them. They all served a similar purpose, however they all did it in pretty different ways, and had numerous different interface concepts, so this truly will come down to personal preference. In July, 2014, which was still in the earlier phase of the smartwatch craze, I purchased a smartwatch from a kickstarter company, Pebble, and to this day regret getting rid of it somewhat. At the time I was running a Moto Droid that was a few years old (due to shattering my iPhone 5, and not having the means to replace it at the time), and with Android, the Pebble Smartwatch was fully functional, and amazingly affordable. It had an e-ink display, which lended quite well to battery life, it would go up to 8 days on a single charge typically. Sure, it didn’t have all of the functionality that the modern watches do with heart rate sensors, and activity tracking, however you could pause, and play music, view your notifications, and even utilize the buttons as a keypad, and reply to text messages! When I went back to iOS however, the functionality dwindled down to being able to pause and play music, as well as viewing notifications. Well in April, 2015, Apple unveiled something pretty cool that I had my eye on, the Apple Watch, and I couldn’t seem to take my eyes off it now that I was back on iOS for a phone. Given that I purchased the watch for $200, being able to sell it for $150 after getting a year and a half of use out of it was a pretty great deal, so I did that, pooled that $150 with some other random cash I had been saving, marched myself to best buy, and purchased an Apple Watch. Do you run iOS? How about OS X? Well, then you chose right if you picked an Apple Watch as your wearable, just as I did after shedding my Pebble Steel. The Apple Watch from the moment I took it out of the box was pretty awesome, their pairing sequence was scanning some weird, flashy looking code, connecting via bluetooth, and then it was good to go. The app support was much higher than that of the Pebble that I owned before it, and rightly so, given the OLED display, touch interface, WiFi connectivity, and the fact that Apple clamps down on app developers that are trying to produce for the device, and makes sure that it’s legit. This thing even has Instagram on it, if you want to scroll that on the 38mm or 42mm display. It allows full functionality with your phone, from replying to texts via handwriting recognition, voice recognition, or canned replies, taking phone calls, storing music, and more! The workout features on the series 1 that I had left much to be desired, however they were steadily improving upon those, and I did notices a pretty substantial improvement with the implementation of WatchOS2. BUT! The caveat is that it only works with devices running iOS, which leads me to how I wound up with my third, and current, device. With Apple not really releasing anything new, and having “gotten rid” of the home button with the iPhone 7, I thought that it might be time to try something new. I was crazy about the concept of the Moto Z, and the modular platform smartphone, so I traded in my steadily decaying iPhone 6, and picked one of those up. The only issue after purchase (that I found out someone had discovered a work around to a little further down the line) was that my watch no longer worked! I wiped it, and attempted to pair it with the new phone, and while the bluetooth would pair, nothing would work. Had I not wiped it, I would have been able to at least use it as a sleek looking watch, however, I did, and the deed was done, so I decided, why not trade this puppy in, and try out another type of smartwatch designed to run on my fancy new Android Phone… that would only last a little more than a year with three replacements. Do you want an activity tracker that has just a few more little features built into it than the standard Fit Bit? How about something that runs well with Android? You want music storage, canned text replies, emoticon responses, GPS Tracking, emergency calling? Well than the Samsung Gear Fit is a great way to go. The Samsung Gear Fit 2, which I’ve been using it for a little over a year and a half now is a pretty great device. Admittedly I’ve been spending the whole last year and a half waiting for the surprise of having my wrist explode, but so far so good! It has great fundamental activity tracking features built into it, I get pretty heavy into biking from time to time, and having the built in GPS for tracking my route, as well as the ability to hold a button and tap for an emergency call is pretty essential. In addition, it offers standard workouts such as running, treadmill, weights, rowing, and an other workout functionality if you’re doing a few things and just want it to keep tracking you all through it. These are admittedly all features that the Apple Watch had, and didn’t seem new to me, however given that the Gear Fit was designed to be a fitness tracker, I did find them to be much more accurate, and useful even indoors. During the initial couple of months I used the device, I found the S-Health App quite cool, especially with its integration of measurements of water, and coffee intake right from the watch screen. I used them religiously for about a month, and suddenly realized its not worth it. I’m sure there are people out there that find that stuff quite important, but it’s not high on my priority list. For the price of this little device, you really can’t go wrong for how much of a punch it packs, however given that I’m now back on iOS, it’s only slightly more useful than my Pebble was, and that’s simply due to the difference in the Watch’s OS, and design. As with a lot, the preference is purely subjective.. First of all, what device do you own? Are you an Android user, or an iOS user? What is your primary use for this device, activity tracking, or do you want major functionality? These are only three devices, and out of these devices, one has been purchased by a rival company, and discontinued, and two have undergone major updates. The Pebble, though acquired by Fit Bit and discontinued, added activity tracking features and many more aspects to it before it was discontinued, and is still available for purchase via Amazon. To me, for the price, they’re a perfect device. The Apple Watch is the way to go, if you’re running an iPhone that is. It’ll likely be what I switch back to when this Gear Fit dies out on me, simply because I’ve gone back to iOS, and may as well go all in again. The Gear Fit, if you’re looking for a sightly more functional activity tracker, is what I would recommend. It’s priced at the same point as the Fit Bit, however it does offer more functionality with an Android phone than the average activity tracker, and for $120, they’re priced to move!